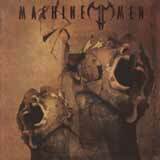 Machine Men is a group of young Finnish men (all in their early 20’s) playing traditional melodic heavy metal. The band formed in 1998, and after some demo activity, finally recorded their debut album, Scars & Wounds in 2002 on Dynamic Arts Records in Finland. Earlier this year, Machine Men signed a worldwide deal with Century Media Records. That brings us to the present, which sees Machine Men released their sophomore album, Elegies. Although they are from Finland, Machine Men have not followed the easy path of becoming another Stratovarius / Sonata Arctica clone. Instead, the band has chosen a more traditional metal flavor for its sound. A very obvious Iron Maiden influence flows through the entire album, yet the production gives the album a feeling more similar to Bruce Dickinson’s recent solo albums. Anthony, Machine Men’s lead vocalist sounds like Dickinson’s twin brother more than just a few times on this album. He doesn’t possess quite the range or power as the “Air-Raid Siren” himself, but Anthony is certainly an excellent vocalist that is perfect for this band. Just to make the Iron Maiden / Bruce Dickinson comparison more complete, I’ll point out that Machine Men (the band’s name) is also a song title from Dickinson’s Chemical Wedding album. That’s not all, check out the last track of Elegies. Yes, that version of Freak is a cover of the opening track of Accident of Birth! Well, after what you’ve read up to this point, you can surely guess that this album is not exactly original or groundbreaking. True. However, Elegies is an excellent album, proving that the band is great at what they do, and able to create songs that have a definite lasting value. Aside from the outstanding Dickinson vocal performance, strong guitar work is a key ingredient to the band’s music. Of course, the band loves to employ lots of dual leads and classy guitar solos. The rhythms forge ahead with a force and heaviness very similar to the heavier side of Accident of Birth. However, songs such as October and From Sunrise to Sunset see the band delve into slow and mid tempo territory, and they pull it off quite well. The guitar work is still crunchy and authoritative in both instances, which gives the songs a sense of urgency despite their slower approach. All around, the guitar sound is heavy, not sounding at all like a retro tribute to Iron Maiden. As I said earlier, the guitar sound is has a tone similar to Bruce Dickinson’s solo about, but technically executed in a way very similar to classic Iron Maiden. Having said that, Machine Men make no secret to hide their chief influences, yet they are able to add their own touch, and thus create an inspired and personal sounding album. Before I know it, 45 minutes is up, and the album comes to a close. That can only be considered a good thing, I suppose. Each of the songs is a keeper, no filler on this album at all. The guys add a nice, but not overpowering melodic quality to their music. A very nice balance is struck between heaviness, vocal prowess, and catchy, melodic parts. This all adds up to produce an album with lasting power that is sure to please. Although the Iron Maiden / Bruce Dickinson influence is inescapable, Machine Men are able to add just enough of their own touch to the music. Furthermore, the guys are just great songwriters. I hadn’t heard of this band before, but Elegies is enough for me to become a fan of Machine Men. This is the type of album that can easily stay in your listening rotation for weeks at a time and not get old. Obviously, fans of Iron Maiden and Bruce Dickinson’s solo work should check this album out. These guys certainly provide another dimension to the Finnish metal scene. As long as the guys keep coming up with quality songs and consistent albums such as Elegies, there’s no reason not to expect them to have a successful career.